Hope that all of you had a wonderful Mother’s Day? I got spoiled with a house full of flowers and presents and the ultimate: I got to sleep in until 8 AM. I was so rested I can’t even tell you (isn’t that kind of sad that extra sleep was my biggest perk!?) I also got to spend brunch with my husbands family and then dinner with mine. Plus it is also my sister’s birthday (HAPPY BIRTHDAY JULIE!!!) so kind of a really fun day all around. And now I am heading into the most wonderful week: My book comes out TUESDAY!!! Amazon even sent me an email that my book has shipped, so if you pre-ordered it, you should be receiving it any day now! Please don’t forget that if you buy the book any time before May 20th you are also eligible for a free recipe bundle- DETAILS HERE! 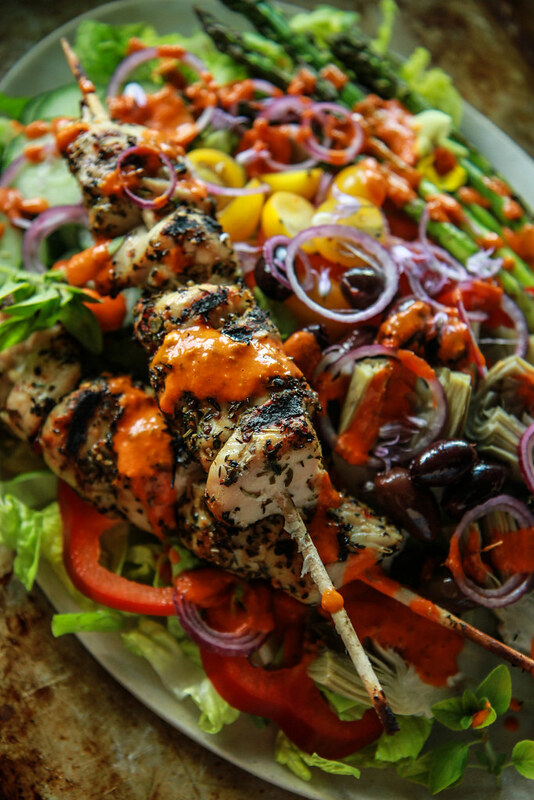 Onto the Salad at hand: Grilled Chicken Souvlaki Greek Salad. Obvioulsy I learned about souvlaki from my husband and his family. For those of you who are not familiar, it’s really the most delicious Greek marinated chicken skewers that are grilled. They are made with pork or chicken and tender from a marinade full of lemon juice and olive oil and flavored with garlic, oregano and pepper (I used red pepper flakes). 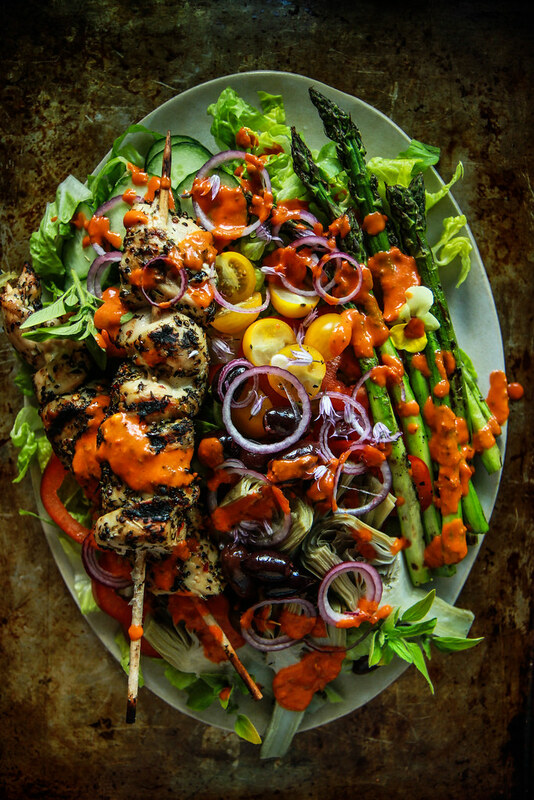 They are a really easy way to entertain for large groups, but today I am showing you a favorite week night dinner for my husband and I.
I like to pile those delicious chicken skewers along with grilled asparagus and tons of fresh veggies and lettuces and then add some zesty roasted red pepper vinaigrette for a flavorful touch. Try it this week for your own family and tell me what you think!! Mix the oil, lemon juice, oregano, garlic, salt and red pepper flakes in a small bowl. Skewer the pieces of chicken on 4-6 skewers and place them in a Ziploc bag. Add the marinade and marinate at least 30 minutes and up to a few hours. For the Vinaigrette: For the vinaigrette, put all of the ingredients into a blender and blend until smooth and creamy. Season to taste with kosher salt. Set aside. Take the chicken out of the bag, and add the asparagus spears to the left over marinade. Grille the chicken over medium heat, turning to cook on all sides, for about 5 minutes total. Let the chicken rest while you grill the asparagus- about 1 minute on each side. Pull of the grill and compose the salad. On a platter (or two large plates) lay out the romaine and then add the chicken skewers and asparagus. Add the tomatoes, artichoke hearts, olives, red onions, bell pepper slices and cucumber slices. 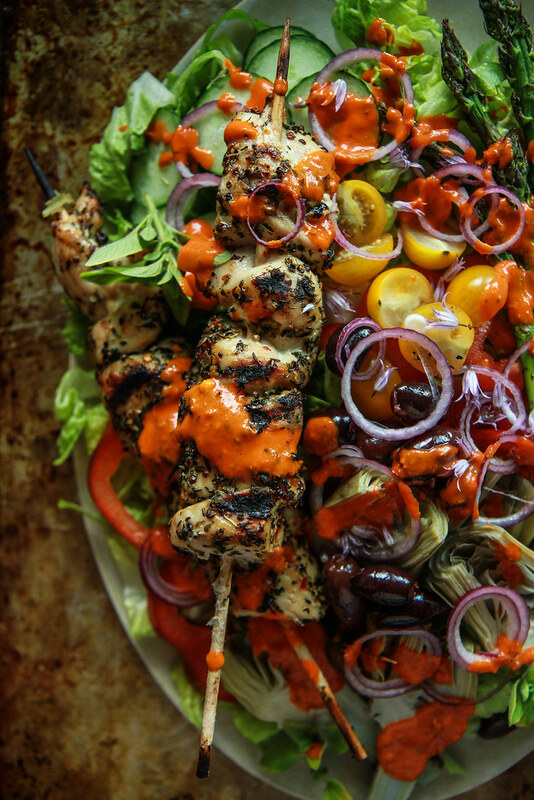 Drizzle the salad and chicken with the red pepper vinaigrette and serve. I love chicken souvlaki, what a killer salad! Your sister’s name is the best 😉 hope you had a great Mother’s Day, Heather! This salad needs to be on my plate now! Love all those veggies in the salad! Another gorgeous salad Heather! Want! Happy birthday to your sis! Soon excited for your book & this salad!! Don’t usually comment on recipes but I made this last night & it was absolutely Incredible! thank you Patti- it means a lot to me to hear from you! Congrats on the book Heather! This souvlaki looks so damn good! Definitely adding it to my must-make list! For the vinaigrette, do you mean “red wine vinegar” or truly “red wine vinaigrette” as you listed it? Thanks! And it looks absolutely beautiful…can’t wait to try it! Patricia- I absolutely meant red wine vinegar! I will fix that and thank you!